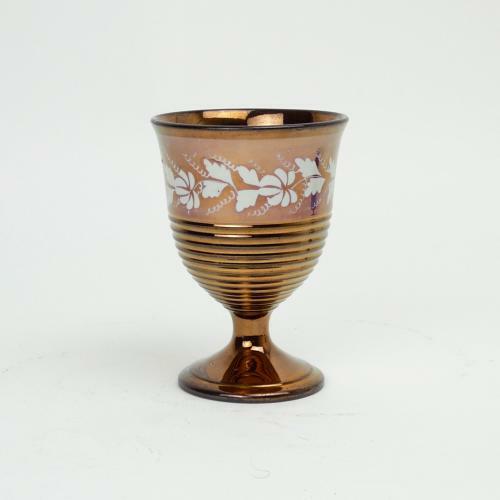 A pink and copper lustre pottery goblet. This piece dates from c.1830. It is mostly covered in a copper lustre glaze and there is a band of pink resist lustre around the centre. This type of decoration was produced by the use of metallic oxides in the glaze. Both copper and pink lustre are produced by gold oxide. Where the glaze is on a terracotta body the result is the copper lustre and where the gold oxide is on a white background it produces the pink lustre. The band of what is known as resist decoration is produced by painting the design in oil on the white background. The oil burns off in the kiln, or 'resists' the glaze, and the background colour shows through. The piece is in excellent condition.